I’ve always been fascinated by the offspring of super achievers. If their moms, dads, grandparents or great grandparents are heavy hitters in politics, the arts, medicine, sports, the military or scholarly pursuits, these kids have quite an act to follow. Independent filmmaker Rory Kennedy, the youngest child of Ethel and Robert F. Kennedy, has certainly done her due diligence and carved a worthy niche for herself. The Emmy Award winner and recent Academy Award® nominee has produced and directed a formidable body of work–more than 25 films–on hot button social issues. 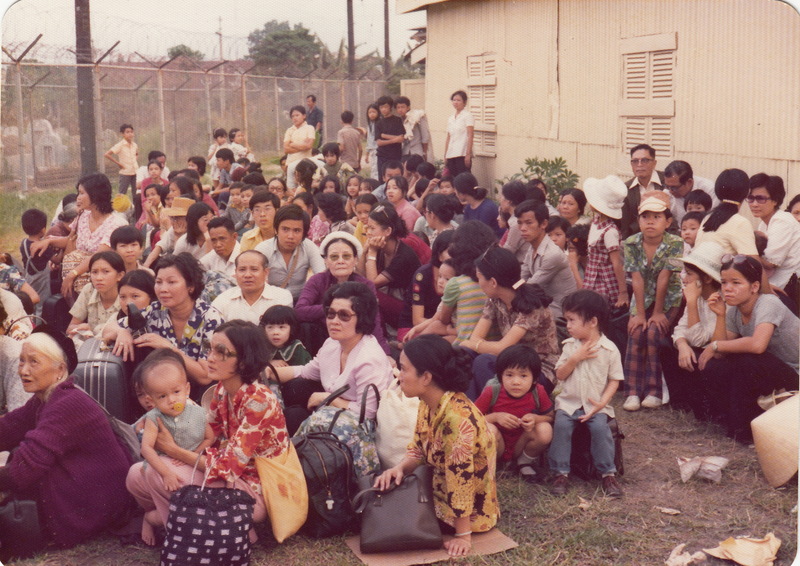 A crowd of South Vietnamese refugees patiently waiting and trusting that they’ll be evacuated. Photo courtesy Stuart Herrington. Herrington was a Captain during the Vietnam War and served as an intelligence advisor to the South Vietnamese. He is front and center in Last Days in Vietnam alongside an impressive line-up of American and South Vietnamese military men of good conscience, U.S. government officials, intelligence officers and South Vietnamese civilians who recall the chaotic final days of the war and the burning moral question that they faced: “Who goes and who gets left behind?” The story that unfolds from their vantage point is gripping. Even if you watched this debacle play out on the evening news at the time, I guarantee that you will be hard-pressed not to be awe-struck by the powerful news and military footage compiled for this film. Shot during the thick of the massive evacuation efforts, the footage documents activity never before shown on stateside evening newscasts. 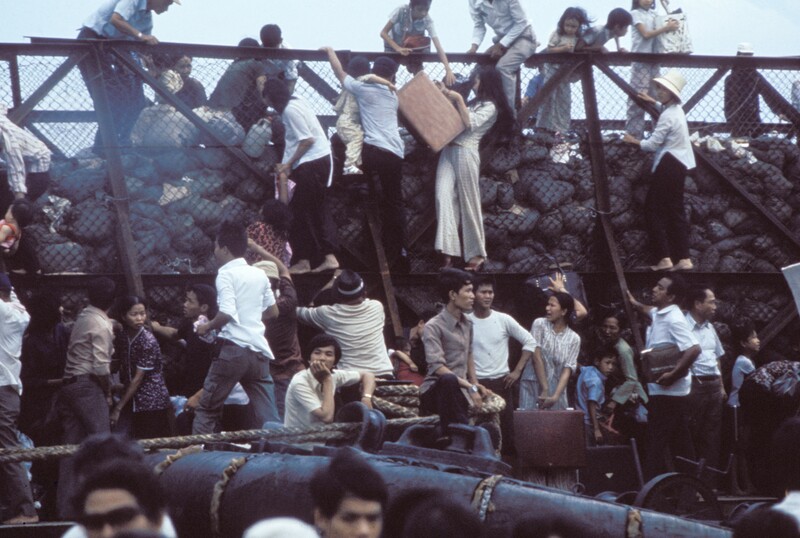 Desperate South Vietnamese climb aboard barges in the port of Saigon to escape advancing North Vietnamese troops on April 28, 1975, the day of the fall of Saigon. Photo ©Nik Wheeler/ Corbis. As the North Vietnamese approached Saigon, relieved by the resignation of their mortal enemy, Richard M. Nixon, American officers and officials on-site had two choices: evacuate U.S. citizens and their dependents only, or defy orders and also save their South Vietnamese comrades, friends and families. Aboard the U.S.S. 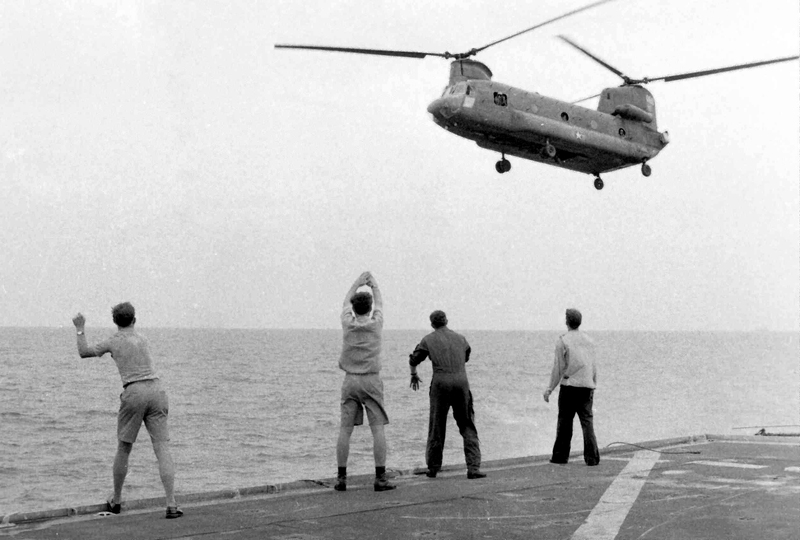 Kirk, crew members signal a Chinook copter to hover over their deck and drop its passengers. The chopper was too heavy to land on deck. Photo courtesy Craig Compiano/USS KIRK Association. 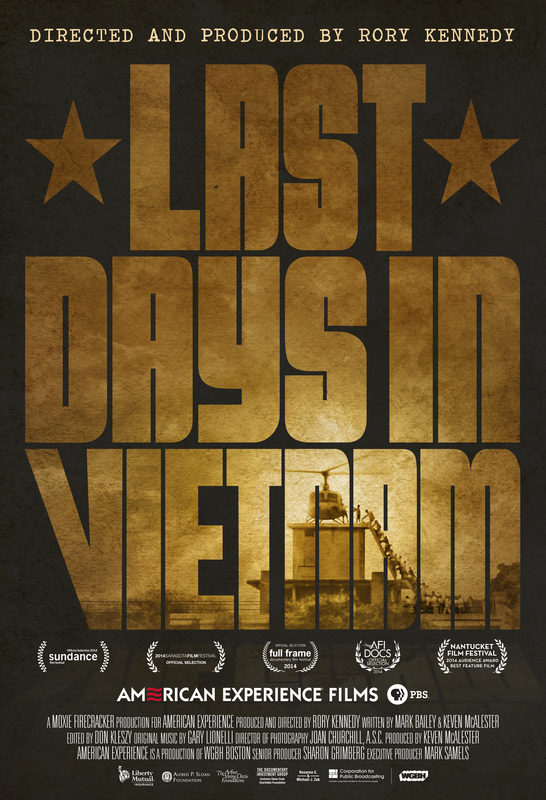 One of the more prolonged and moving segments in Last Days in Vietnam focuses on the challenges faced by the U.S Naval officers and crew on board the U.S.S. Kirk. Part of the fleet sent to evacuate Americans only, the crew and the ship–“with its single, tiny helipad”–was ill-equipped to handle the endless stream of helicopters attempting to land on the American destroyer. The choppers were piloted by South Vietnamese airmen fleeing for their lives with their families and friends. A youthful South Vietnamese man, who was six years old at the time, vividly remembers the day his dad, a South Vietnamese pilot, skillfully catapulted his young family onto the U.S.S. Kirk from a Chinook chopper hovering above. It was too large to land on the ship. Location footage and recollections from the Kirk’s captain and commanding officer bear witness to the pilot’s amazing aeronautical feat and others performed by the Kirk’s crew. 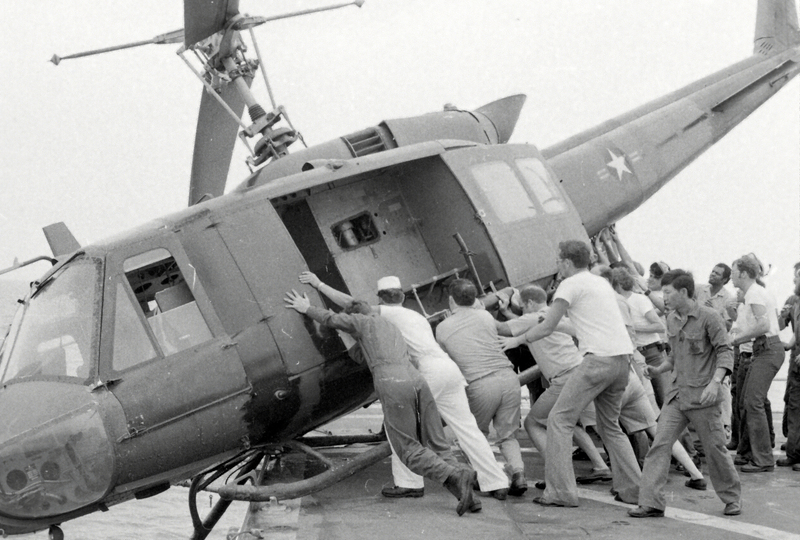 Crew members push a helicopter off a landing platform of the U.S.S. Kirk to clear the deck for more helicopters dropping off refugees. Photo courtesy Craig Compiano/USS KIRK Association. This is the stuff of true heroism and Last Days in Vietnam is a testament to their bravery, ingenuity and humanity in the face of a war gone horribly, shamefully wrong. What comes across here are the heartfelt efforts of by-the-book military men, U.S. Intelligence officers and staffers who risked life and limb and faced career suicide to run unsanctioned, seat of-the-pants operations to save and evacuate as many South Vietnamese as they could, by land, sea and air. The way they did it is astounding; and the seemingly insurmountable obstacles they faced, sometimes overcame … and sometimes didn’t … will keep you on the edge of your seat and also break your heart. In conjunction with the film, American Experience is launching a national outreach campaign inviting Vietnamese Americans and veterans to share their experiences. “We knew there were so many more stories–of those who were evacuated and those who were left behind but who eventually made their way to the U.S.–and we wanted to create a platform to share, preserve, and honor their experiences,” says Mark Samels, American Experience Executive Producer. These stories will constitute the First Days Story Project at http://www.pbs.org/firstdays to be archived in the American Folklife Center at the Library of Congress. This entry was posted in Film, TV and tagged American Experience, fall of Saigon, First Days Story Project, Last Days in Vietnam, Mark Samels, Richard Armitage, Rory Kennedy, Stuart Herrington, U.S. History, U.S. Military, U.S.S. Kirk, Vietnam War. Bookmark the permalink. Thank you, Carol. If you missed the first airdate on PBS, you can watch it on-line at PBS for free. The link for streaming is at the beginning and end of my article. I also list other ways to access it at the end of my article. It’s a powerful film. Great writeup Judy. I was planning to watch this; now I won’t miss it. Much appreciated, David! I hope you were able to watch it.